An Easter show of 160 beef cattle in Ballymena on Thursday resulted in a sharp trade. Beef cows sold to 181p for 600kg at £1086, Fr cows to 131 for 760kg at £995, beef heifers to 223p for 590kg at £1315, beef bullocks to 212 for 730kg at £1547 and Friesian bullocks to 142p for 560kg at £795. Beef cows sold to: Local farmer AA 600kg £1086 (181), Timothy Wray, Carnlough Lim 740kg £1221 (165), John Beggs, Whitehead BB 630kg £1039 (165), Lim 640kg £1036 (162), Lim 650kg £1053 (162), J McHenry, Mosside Sim 670kg £1065 (159), I Beggs, Whitehead Lim 740kg £1176 (159), Martin McGarry, Broughshane Blonde 670kg £1045 (156), E O’Donnell, Toomebridge Char 730kg £1131 (155), Mike Frazer, Templepatrick Sim 680kg £1047 (154), JW Harbinson, Limavady Lim 650kg £975 (150), Mrs Diana Kennedy, Larne Lim 710kg £1029 (145), J McHenry Lim 650kg £936 (144), M Moffett, Broughshane Lim 560kg £800 (143), local farmer Lim 710kg £986 (139), Timothy Wray, Carnlough Sim 660kg £917 (139), SJ Duncan, Crumlin Sal 570kg £792 (139), Robin Kennedy, Dundrod Lim 800kg £1044 (138), Lim 610kg £835 (137), John Beggs, Whitehead Lim 730kg £992 (136), Mrs Janet Duncan, Crumlin Lim 570kg £752 (132), S Fullerton, Bushmills Fr 760kg £995 (131), Mrs Diana Kennedy, Larne Lim 670kg £864 (129), Mrs Janet Duncan, Crumlin Lim 580kg £748 (129). Friesian cows sold to: S Fullerton, Bushmills 760kg £995 (131), Sean McCrystal, Maghera 730kg £919 (126), W Weatherup, Carrickfergus 700kg £882 (126), CFG & JC Adams, Dungonnell 790kg £987 (125), A Harbinson, Rathkenny 620kg £775 (125), Drumabest Farms, Kilraughts 730kg £905 (124), WW McCormick, Ballycastle 770kg £931 (121), A & W McMaster, Broughshane 650kg £773 (119), R Montgomery, Ballycastle 550kg £654 (119), Drumabest Farms 680kg £788 (116), I Stewart, Bushmills 620kg £719 (116), WR Hamilton, Broughshane 710kg £816 (115), J Blair, Larne 660kg £759 (115), W Weatherup, Carrick 710kg £795 (112), WW McCormick 630kg £705 (112), local farmer 490kg £543 (111), I Stewart, Bushmills 590kg £654 (111), GN Andrews, Newry 540kg £594 (110), local farmer 500kg £540 (108), W Weatherup, Carrickfergus 670kg £723 (108), Joseph Adams, Ballymena 580kg £620 (107), local farmer 600kg £636 (106), CFG & JC Adams, Dungonnell 590kg £625 (106), JW Harbinson, Limavady 600kg £636 (106). Beef heifers sold to: Timothy Wray, Carnlough Lim 590kg £1315 (223), Lim 660kg £1438 (218), Lim 620kg £1289 (208), W Kirkpatrick, Dundrod Lim 550kg £1122 (204), Robert Milne, Bellaghy Lim 540kg £1053 (195), Patrick Logan, Ahoghill Lim 550kg £1067 (194), Robert Milne, Bellaghy Lim 550kg £1067 (194), Timothy Wray, Carnlough Lim 560kg £1069 (191), W Kirkpatrick, Dundrod Char 630kg £1197 (190), Char 580kg £1078 (186), Stephen Hill, Carrick Char 580kg £1078 (186), W & G Hanna, Ballymoney Lim 480kg £878 (183), Mrs H Minford, Nutts Corner Lim 470kg £850 (181). Blackburn Bros, Clougher Lim 730kg £1547 (212), Robert Milne, Bellaghy Lim 550kg £1149 (209), TJA & RA Kennedy, Cullybackey AA 660kg £1366 (207), Blackburn Bros Lim 760kg £1550 (204), TJA & RA Kennedy Her 610kg £1238 (203), AA 650kg £1300 (200), H Crawford, Moneyrea BB 830kg £1651 (199), BB 740kg £1443 (195), Char 710kg £1384 (195), Andrew Adams, Ballymena BB 600kg £1164 (194). Friesian bullocks sold to: Brian Lyttle, Moorfields 560kg £795 (142), 600kg £822 (137), 540kg £734 (136). 26 dairy cows and heifers on Friday met excellent demand to £1870 for a calved heifer from Bolton Bros, Maghera, calved cows to £1560 for a third calver from Thomas Carlisle, Dundrod. Ruling prices: Bolton Bros, Maghera calved hfr £1870, calved hfr £1730, calved hfr £1720, local farmer (3) £1700, Bolton Bros £1580, Thomas Carlisle, Dundrod calved cow £1560, calved cow £1460, RR Cupples, Rathkenny calved hfr £1430, J King, Ballymena calved hfr £1380, calved cow £1380, calved cow £1360, DW Graham, Clough calved cow £1300, T & J Mackey, Ballynure calved cow £1280, Andrew McCullough, Hillsborough calved cow £1260, T & J Mackey calved hfr £1140, James Watt Jnr, Templepatrick calved hfr £1100. 18 lots in the suckler ring sold very readily to £1920 for an 11 month old ped Lim bull from W Campbell, Carnlough. G Hagan, Sevenmile Straight sold an Aub cow with a Lim bull for £1700. Ruling prices: G Hagan, Antrim Aub cow & bull calf £1700, Lim hfr & hfr calf £1680, BB cow & hfr calf £1580, Patrick Logan, Ahoghill Lim hfr & bull calf £1480, D Allen, Moneymore Lim hfr & bull calf £1460, G Hagan Char cow & hfr calf £1320, Char cow & hfr calf £1280, Adrian Linton, Glarryford SHB hfr (in calf) £1220, Ian Barr, Kells Lim cow in calf £1200, Patrick Logan, Ahoghill Lim hfr & bull calf £1180, Wm Burns, Islandmagee Sim cow in calf £1150, Olive Bell, Dundrod Lim cow & bull calf £1080, I McMullan, Glenarm Lim hfr in calf £1050, AA hfr & hfr calf £1000. 236 lots in the calf ring sold well to £500 for a Lim bull (5 months), younger lots to £470 for a Lim bull (6 weeks). Heifer calves to £475 for a Lim (5 months), younger lots to £350 for a SHB (5 weeks). Beef bred bull calves sold to: Miss ME McCullough, Ballynure Lim £500, Simon Moore, Aldergrove Lim £470, Samuel Brennan, Larne BB £430, Leslie Wilson, Doagh Sim £410, Miss ME McCullough Lim £400, RJ White, Liscolman Lim £375, Samuel Kennedy, Doagh BB £375, Leslie Wilson Sim £375, Sim £375, Samuel Brennan BB £365, M Martin, Randalstown Lim £345, L Mathers, Strabane BB £340, (2) BB £365, WJ Bond, Eglinton Lim £330, T Herbinson, Randalstown AA £320. Heifers sold to: Miss ME McCullough, Ballynure Lim £475, D McKay, Broughshane Lim £445, Lim £410, Miss ME McCullough Lim £400, Lim £380, Simon Moore, Aldergrove (2) AA £360, Old Church farm, Glenarm SHB £350, Leslie Wilson, Doagh Sim £340, £325, J & J Huey, Armoy Lim £320, R Morrow, Glenarm Lim £315, Leslie Wilson Sim £295, J & J Huey Lim £290, RLA & D Irvine, Dundrod BB £270. Friesian bull calves sold to: Miss ME McCullough, Ballynure £190, WJ Bond, Eglinton £175, George Forsythe, Cloughmills £165, M Gribbin, Desertmartin £165, Samuel Brennan, Larne (3) £165, £160, Miss ME McCullough £145, £130, David A Strange, Ballyclare £115, M Gribbin, Desertmartin £110, David McClintock, Moorfields £100, J & J Huey, Armoy £90, David A Strange, Ballyclare £85, Miss ME McCullough £75. An entry of 943 sheep in Ballymena on Wednesday resulted in a sharp trade. Fat hoggets sold to 396p for a pen of 14 Texels 23kg at £91.20 offered by A & T Shiels, Kilrea. Spring lambs sold to 461p for a pen of Dorsets 21kg at £97 presented by Connon Bros, Ballymena. Fat ewes sold to £98. Fat hoggets (503) (Top prices per kg): Alan & Thomas Shiels, Kilrea 14 Tex 23kg £91.20 (396), I Montgomery, Glenwherry 3 CB 23kg £91 (395), 10 BF 23kg £90.20 (392), Wm Ridges, Ballycarry 13 BF 22.5kg £88 (391), A Smyth, Moorfields 1 Dor 21kg £82 (390), 1 Tex 24kg £92 (383), CFG & JC Adams, Dungonnell 15 Tex 25kg £94.20 (376), S Gregg, Glarryford 4 Tex 23.5kg £88.50 (376), Wm Weir, Milebush 25 BF 24.5kg £92.20 (376), Colin J Price, Nutts Corner 3 Tex 24.5kg £91.50 (373), TJ & I Bell, Ballyclare 12 Tex 24.5kg £90 (367), Martin Beattie, Moorfields 4 Tex 24.5kg £89.50 (365), B McNeilly, Randalstown 10 CB 24.5kg £89.50 (365), WS McConnell, Ballyclare 20 Tex 24.5kg £88 (359), Roy Carlisle, Newtownabbey 1 Tex 23kg £82 (356), B Gardiner, Kells 2 Tex 23kg £82 (356). 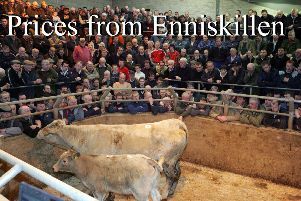 Top prices per kg: Connon Bros, Ballymena 11 Dor 21kg £97 (461), Wm McAllister, Kells 3 Tex 22kg £99 (450), A & J Mackey, Ballynure 8 Dor 22.5kg £98 (435), E Clyde, Muckamore 2 Tex 22.5kg £97 (431), N & J McKee, Larne 2 Dor 21.5kg £91 (423), Robert McKeown, Broughshane 12 Tex 22kg £93 (422), F McNeilly, Glarryford 9 Tex 22.5kg £95 (422), J & F McNeice, Ballymoney 4 Dor 20.5kg £85 (414), J Christie, Cloughmills 1 Tex 18kg £74 (411), Fraser Tweed, Glenarm 5 Suff 22kg £90 (409), R Coleman, Glarryford 1 Tex 21kg £84.50 (402), Connon Bros, Ballymena 2 Dor 21.5kg £86.50 (402), Paul Butler, Rathkenny 27 Suff 24kg £95.50 (397), N & J McKee, Larne 7 Dor 20kg £76 (380), R Wallace, Carrick 9 Dor 18.5kg £70 (378), Russell Craig, Broughshane 4 Suff 25.5kg £94 (368).